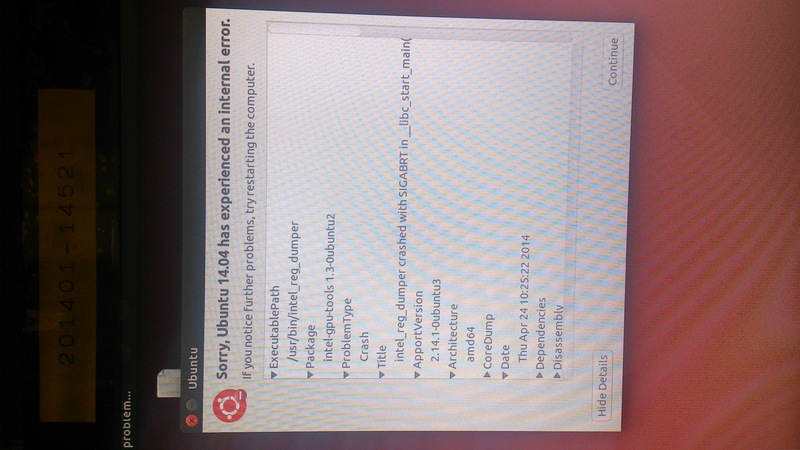 An error dialog will be shown after user login to the desktop environment. The intel_reg_dumper raise SIGABRT on Intel ValleyView Gen7 [8086:0f31] platform. Bumping intel-gpu-tools to 1.7 as SRU is unrealistic, and backporting new hw support didn't fix it, so the easiest way to work around this issue is to not abort() when it fails to detect the chip gen related register maps. This should prevent core dumps and the crash reports. None really, it just won't dump core which hardly anything relies on.. The intel_reg_dump of intel-gpu-tools v1.6 works fine. Will it be back ported to trusty? Yes, I've just uploaded a version to trusty-proposed that makes intel-reg-dumper not abort() when it checks the supported register map. That should prevent crashes which is all that can be backported..
Hi Timo, can you update the bug description with the SRU template? Also I'd like to know why removing the abort() call makes sense, because in the 1.7-1 version that call is still present. Is the abort() call the right way to handle that code path? Accepted intel-gpu-tools into trusty-proposed. The package will build now and be available at http://launchpad.net/ubuntu/+source/intel-gpu-tools/1.3-0ubuntu2.1 in a few hours, and then in the -proposed repository. I have installed and verified the intel-gpu-tools 1.3-0ubuntu2.1 on target machine, the issue is fixed. The verification of the Stable Release Update for intel-gpu-tools has completed successfully and the package has now been released to -updates. Subsequently, the Ubuntu Stable Release Updates Team is being unsubscribed and will not receive messages about this bug report. In the event that you encounter a regression using the package from -updates please report a new bug using ubuntu-bug and tag the bug report regression-update so we can easily find any regressions. * dont-abort-regdumper.diff: No need to abort() on unsupported systems.